Password security and real life: How Dropbox and Snapchat were compromised Why do we still use the QWERTY keyboard? Costaconnected has never been an advice column, and I’m not going to tell anyone what to do. Although I rant and rage about it in these pages, obviously I love Facebook as much as I hate it – it’s an important part of my life, and I’ve been using it probably most days for the last six years or so. The important thing to remember though is that you usually have a great deal of control about exactly how you use it. For example, you can set up a very basic profile, and lock down all the privacy features you want. 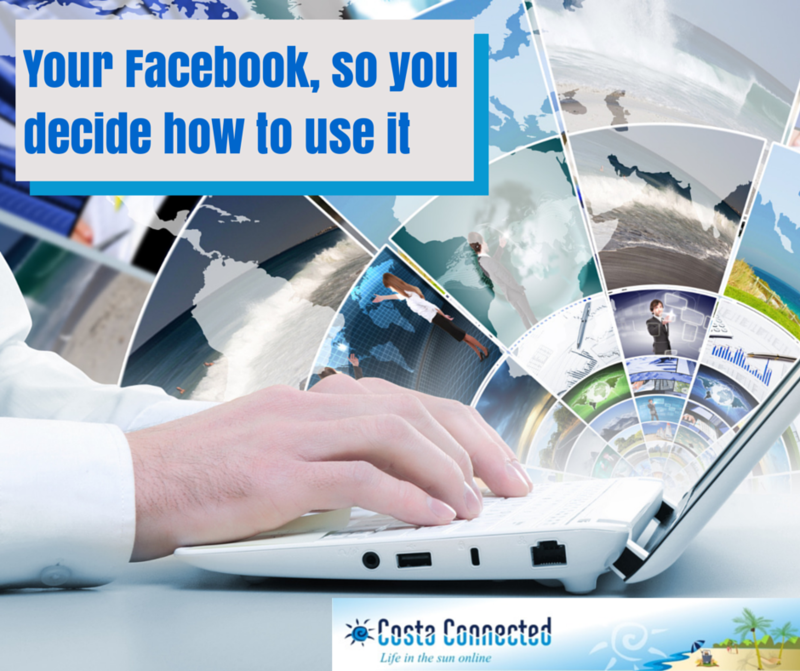 You may need a Facebook account to join Facebook groups related to activities you want to be involved in, or to receive invitations to Facebook events – but you don’t ever need to share any photos or information that you don’t choose to. Although Facebook has recently had a major purge of inappropriate user names – such as people using their business name within the profile name, which is disapproved of – there is no way for Facebook to enforce that you are using your actual given name, if for whatever reason you prefer not to do so. Most account creation is automatic, and will not be flagged for review by a human unless the profile contains something suspicious. Remember however if you want people to be able to find and you on Facebook, they will actually need to know what you’re called there – otherwise it will be down to you to find your friends and invite them (and perhaps to let them know it’s you some other way, if you’re using a name they won’t recognise). When it comes to profile pictures and cover pictures, once again provided you are not using something which violates the terms and conditions (such as a business logo or something obscene), then you can use whatever you like – it certainly doesn’t have to be a picture of you if you prefer otherwise. And you don’t have to accept friend requests from anybody that you would rather not, and you don’t have to follow any feeds, pages, groups or individuals whose output you would prefer not to see. I have one relative who has about 20 friends on Facebook – they are all his immediate family, he has no interest in connecting with anybody else, never mind groups or brand pages. He just enjoys seeing what his family are up to and sharing, as they live all over the world. He almost never comments, never mind updates his own status… But he uses the ‘like’ button to let people know he’s seen or read something or enjoyed looking at picture that’s been shared. In a world where people have less time and inclination to pick up the phone for a chat, this connectedness is a good thing – it hasn’t made me call him less, we were always bad at that anyway, and it gives us more to talk about with immediate and recent relevance when we do actually see each other and speak. Another friend in the UK only opened her Facebook account to help plan her daughter’s wedding. She set up a small private group, with just family and friends who were going to be guests – and used this to help coordinate lifts and accommodation, share information about the stag and hen nights, and afterwards to share wedding photos and feedback. Apart from this group, I don’t think she’s really touched her Facebook account – but the group created a happy if temporary space for family and friends to come together and celebrate something beautiful and good. A third friend deleted her Facebook account two years ago, as part of a purge after escaping from an abusive relationship. However when she was ready to move on emotionally and and resurrect a social life in a new town, she found herself turning to Facebook once again – using a different name, a less identifiable photo, and maintaining strict control over what information she shares. She has been able to build a new profile and use it to stay in touch new friends, as well as reaching out to some old ones. In fact, settling and starting over a new area, she has found Facebook and other social media a vital tool for connecting in a way that helps her to feel safe and in control.